Jericho was a big city, an impenetrable city, ten story walls…a Generals nightmare strategically. No way to sneak up on it, No way to get past its walls. To look on that city from the outside must have been something. The Lord promised Joshua that the city would be his. His if he trusted God, was faithful, and followed His instruction. In the Old Testament there are so many times where God gave instructions and they were to be followed to the letter, the exact measurement. God is very specific, he doesn’t leave room for our interpretation. He takes care of it all. It must have taken great faith for Joshua and his army to follow God’s instruction. They were commanded to walk and circle around the city once a day for six days. Blowing their trumpets but they were ordered not to speak a word until they day they were told. 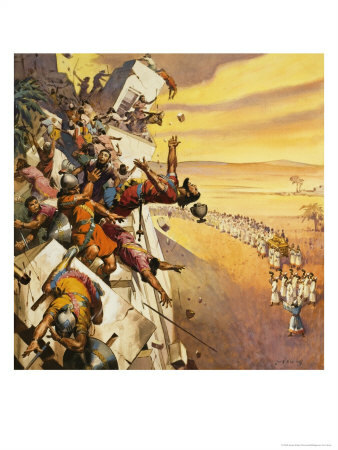 On the Seventh day, they circled the city seven times, and the last time around, the seven trumpets sounded and the army was given the command to shout and the walls of Jericho came crashing down! Friends, how faithful are we to trust the same God? We need that faith! What ever “walls” we have in our life – problems, addictions, whatever….We need to follow God’s Word, follow the instructions to the letter and wait on him to tell us when to shout for victory! The same God who defeated Jericho, will defeat the Jericho’s in our lives if we only let him. We need to trust, believe, and listen and the victory will be ours! Stay encouraged and not discouraged and know that God is on your side. Make you needs and desires known to Him and he will listen and tell you when to shout. Be blessed! Until later, I’m just tryingtobeamanofgod! I had this come back to me today so I thought I would reblog it..Blessings!